When it comes to matters of family law, we understand that there are a multitude of emotions involved. Often, family law matters are intensely personal and hard-hitting, and that’s why the Law Offices of Ginger West Johnson strives to handle your case with dignity, care and compassion. 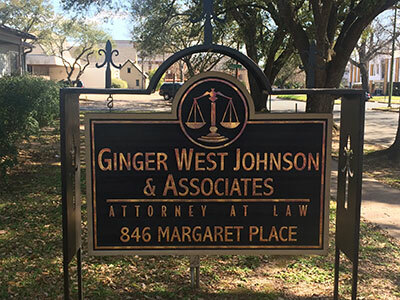 At the Law Offices of Ginger West Johnson, your case is a priority. We recognize that family issues are rarely simple, and we strive to make the legal process as painless as possible. If you are a resident of Bossier City, Shreveport, Minden, Mansfield, Homer, Haynesville or Coushatta and you are in need of a dedicated and experienced divorce attorney or family lawyer, contact the Law Offices of Ginger West Johnson at 318-734-9905 today. If you have made the decision to go through with a divorce, you recognize that you face changes in the road ahead of you. Even if you are just at the stages of considering divorce, it is important you consult with an attorney to learn about your rights and the divorce process in Louisiana. The Law Office of Ginger West Johnson has an established family law practice and is led by a lawyer with a proven track record. Attorney Ginger West Johnson works with men and women in Northern Louisiana, Shreveport and surrounding areas. She offers hands-on guidance through the divorce process and is well-known for her legal abilities in the courtroom. Our team takes a unique approach to working with all clients. We have experience handling divorce cases that involve support and alimony, cases that involve children, custody and child support issues — as well as those involving businesses and complex asset division. We take time to help educate you about the divorce process in Louisiana and what the courts consider when making decisions on alimony (sometimes called spousal support), property division, child custody and more. Ms. Johnson works to make the negative impact of divorce as minimal as possible for you and your family. She is proactive in negotiating to reach a fair settlement for her clients and has significant experience litigating in the courtroom. Louisiana is considered a community property state with regard to asset division, which means that property acquired during the course of the marriage is not separate property, but “community property.” Assets and debts are divided fairly between spouses, which may or may not be 50-50. It is important you work with a lawyer who is knowledgeable of property division laws and how to deal with issues concerning both separate property and community property. We offer our clients a broad range of skills handling all types of property division issues. We welcome the opportunity to meet with you to discuss divorce, custody, property division and other issues you be facing. Call 318-734-9905 or contact us online. Your kids are an extremely important part of a separation or divorce. Every parent wants the best for his or her child and wants to mitigate the negative impact of changes to the child. At the Law Office of Ginger West Johnson, we recognize how important it is for parents to have a strong legal advocate during the process. We are ready to provide the support you need during changing times. We offer clients straightforward and honest legal representation — regardless of the issues they face. Attorney Ginger West Johnson has experience working with all types of family law clients, including those facing military custody issues. She is proactive in achieving results for her clients and compassionate about dealing with sensitive issues. A knowledgeable lawyer will take time to work with parents to develop an agreement that is not always necessarily 50-50. The courts will look at a number of different factors when awarding custody, but always keep the child’s best interests in mind. In addition to handling child custody issues, we have experience working with unwed parents who need assistance with establishing paternity and child support. We have handled all types of custody-related issues and have been successful in establishing creative/unique agreements. Military families have unique needs. These are needs that our firm has experience dealing with. Ms. Johnson has worked with mothers and fathers, service members and spouses in issues concerning military custody. She can even work with parents who are deployed. Call 318-734-9905 or contact us online to schedule your first meeting to discuss your custody, visitation or related family law matter. We serve clients in Shreveport and throughout the surrounding Louisiana parishes.